My husband Wally and I were invited by Jack Weyland to the Premier showing of Charly, in Rexburg, Idaho, in 2002. Wally couldn't attend, so I went by myself. I hadn't read the book and didn't have any idea what the story was about, so I went in without tissues. Big mistake! After it was over and I left the theater with my tear-stained face, I thought to myself--Mormon movies are getting better and better! I wonder where the next story will come from? No sooner did I have that thought, than it dawned on me that I had a story to tell. I had just completed two books of family histories for my siblings and my husband's siblings. They each contained histories of our ancestors back four generations. Many of the histories dealt with the ocean voyages of our early ancestors, who were converts to the Church of Jesus Christ of Latter-day Saints, as they immigrated to America and eventually traveled to the Salt Lake Valley. I had spent three years gathering stories from diaries and journals and had grown to love and admire these ancestors for their courage to leave their homelands and for their strength in the face of the many hardships and trials they endured. It was fun to fashion each character the way I wanted them. I loved weaving personal elements into the story. Many of Wally's and my relatives' names are in the screenplay. Ninety percent of the incidents are true--taken from journals and diaries and adapted to my characters. The emigration of 85,000 Saints on sailing ships from Europe to America between 1840 and 1890 is a chapter in Church history that isn't very well known among today's Saints. They are more familiar with the stories of the pioneers crossing the Plains. Nevertheless, most everyone in the Church has had early converts in their family that came across the Atlantic Ocean, from Europe, to settle in Utah, and the surrounding states. If these ancestors hadn't made the sacrifice to come here, they would all still be in Europe without the wonderful freedoms that are afforded us here in America. My screenplay dealt with the voyage of the Amazon immigration ship in 1863, which was unusual in the fact that it sailed from London, England. Most voyages, carrying Saints, came from Liverpool, but it was late in the season, and Apostle George Q. Cannon, who was in charge of the European Emigration, had to come to London to find a ship that was seaworthy enough to bring 800 Saints across the Atlantic Ocean. On hearing that a shipload of Mormons were emigrating, Charles Dickens, of London, was very interested in this strange new religion and made special arrangements to come on board to gather information to write a piece for his monthly newspaper serial, "The Commercial Traveller." The Saints came from all parts of Great Britain to sail on the Amazon to a new land. There were mostly families on board, but there were also many returning missionaries and partial families who were crossing. "On June 4, 1863, I bid farewell to my father, brothers, and sisters and sailed on the Amazon from the London Docks. I felt very sad as we sailed away, to see Old England fading out of sight, and especially those I loved. I did not know that I should ever see them again. My companions were Ellen Derrick, Ellen Hackman, and Lizzie Cornell. We were in an upper berth, and Lavinia Triplett and her sister and cousin were in the lower one. So there were seven of us, and we all kept together till we got to Utah. They gave us the name of "Seven Sisters" while on the journey." 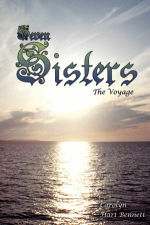 I couldn't pass up a title like this, hence Seven Sisters came to be, and the screenplay followed, depicting the adventures, hardships, and dangers these seven "sisters in the gospel" faced on their ocean voyage on the Amazon. That was the beginning. Now I have completed a second book--the sequel, Seven Sisters: Overland Trek, and turned the two books into three screenplays! They are now available. Contact me at Carolyn dot Hart dot Bennett at gmail.com.